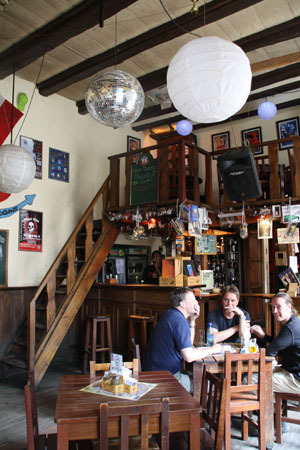 Joy Ride is probably one of the most popular café-bars in town, especially with tourists. This is because it caters for whatever mood you are in. 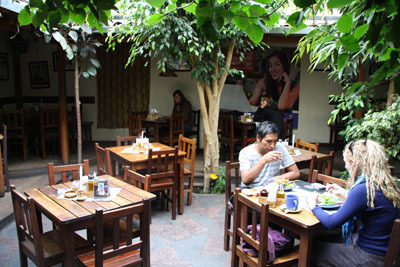 It has a ground floor café where you can chill out and use your laptop over a coffee or snack; a green patio, with tables and chairs, that becomes quite busy at lunch and dinner times; a billiard room; and an upstairs bar which opens late at night as a small club. 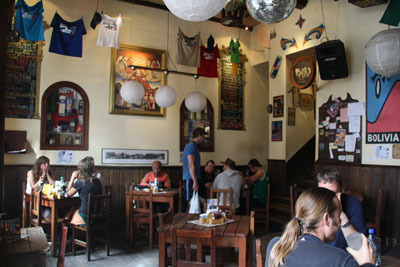 The upstairs bar is also used as a cinema before the area turns into a disco. Films are shown every evening at 19:00 and 'The Devil's Miner' - the award-winning docu-film of the child-miners of Potosi - is usually shown here every Monday and Friday night. Furthermore, there is a reading zone with book exchange and a computer with free internet access. You can order food and drinks on all levels and the menu is quite extensive. 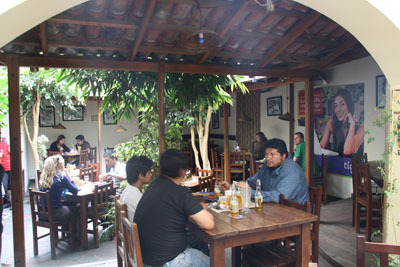 It includes both healthy and hearty dishes such as salads, nachos, typical dishes of Sucre, vegetarian food, fish, international food and great home made deserts. The Joy Ride travel agency is also just next door as well as a shop where they sell artisanal art.